Two things I can't seem to pass up are peanut butter and chocolate. After seeing a recipe over at The Diary of a Real Housewife for Peanut Butter Cup Cookies I melted! Reese's always comes out with holiday versions of peanut butter cups and when we spotted the Valentine Reese's Peanut Butter Cups we grabbed a bag or 2.....ok so more like 3! We followed The Diary of a Real Housewife's recipe to make our cookies with a few changes. We used regular peanut butter without honey and of course we used the Valentine heart peanut butter cups instead of the mini's. Lastly, we don't own a mini muffin tin so we baked them on a cookie sheet. For the full recipe just click on the links above. I split the batch by making half with the peanut butter cup and half without. My son's friend happened to be over which worked out great otherwise I might have inhaled even more! The boys seemed to like the plain peanut butter cookies while me, my daughter and husband went for the peanut butter and chocolate! Either way you make these you will not be disappointed, they are delicious! 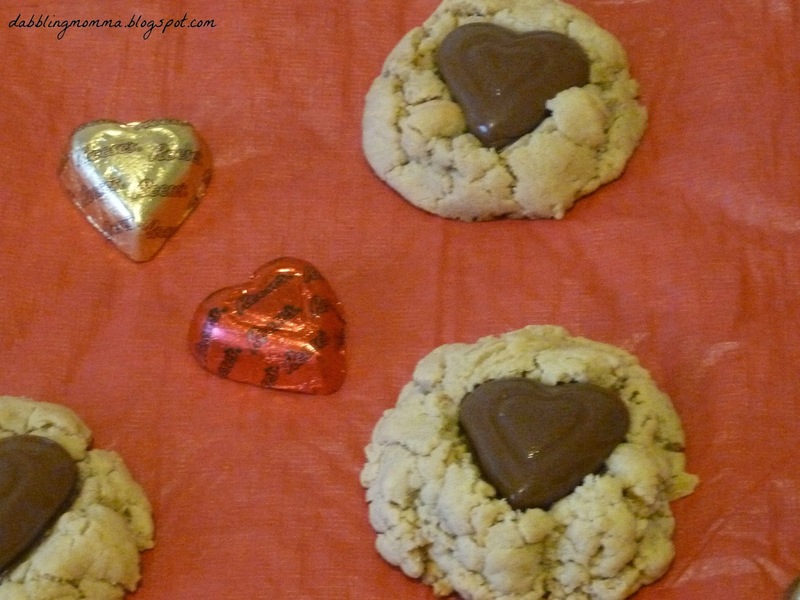 They would be great to bake and share with family and friends on Valentine's Day too! They really were yummy and dangerous, Jennifer - lol! Stopping by from Sunday's Best linkup. I love chocolate & peanut butter too. These cookies are adorable. I'll be whipping up a batch of these for my little Valentines. Thanks for sharing, and please linkup again. Thanks for stopping by, Rhonda! They are really delicious and dangerous, lol!! Oh my! Susen, these look fantastic. You had me at peanut butter. :-)/Thanks again for linking. Thanks, appreciate you stopping by! They are dangerously delicious!! Hi, I'm Susen and it's great to meet you!